As soon as Jean-Claude Killy ended his run in the Alpine downhill competition at the 1968 Grenoble Winter Olympics, the first person to greet him was his mentor and friend, Michel Arpin. Arpin, who worked for ski manufacturer, Dynamic, adroitly hugged his friend, showing photographers his back pouch with the Dynamics logo. A policeman, as instructed to do for all skiers, took Killy’s skis away in order to avoid the “unseemly” display of ski brands adorning an amateur Olympic champion. Arpin then, according to The Complete Book of the Winter Olympics, took one of his skis off and planted it in the snow so that photographers could capture Killy with the ski and the two yellow bars of the Dynamic brand. Killy retired from competitive skiing not long after Grenoble, because he knew that it would be hard to sustain his World Cup skiing dominance and triple-gold medal Olympic achievement. He also knew that he had other worlds to conquer. He signed with sports management firm, International Management Group, and started his career representing such brands as American Express, Schwinn bicycles, United Airlines, Chevrolet, as well as Head, the ski equipment manufacturer which put Killy’s vaunted name on their newest fiberglass skis. Jean-Claude Killy, from the tiny village of Val-d’Isere in the French Alps, was a super star, and was now getting paid enough to live the life of the jet set and do what he pleased. He married an actress, Danielle Gaubert. He competed as a race car driver. He acted in movies, and produced television programs. Eventually he moved into sports administration, joining the executive board of the Alpine Skiing Committee of the International Federating of Skiing (FIS), serving as co-president of the 1992 Albertville Winter Olympics, president of the Tour de France organization, as well as a member of the International Olympic Committee. Killy indeed started from humble beginnings. 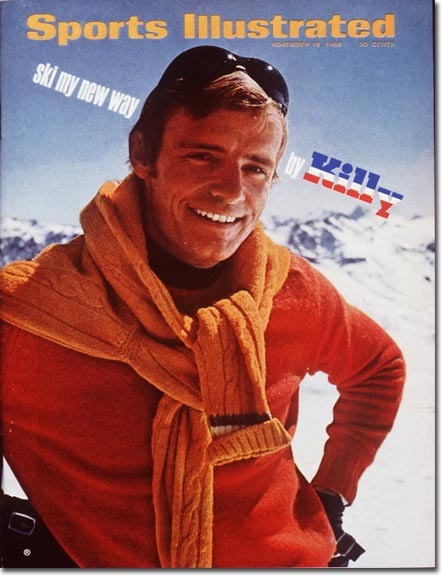 But he felt he had earned his way to the top, focusing on all aspects of how to be the greatest skier of his time, and making the same effort to be the best in his part of the world of business. Thompson recognized that drive in Killy in his profile called “The Temptations of Jean-Claude Killy.” Thompson was following Killy during a marketing tour for Chevrolet, noting that Killy’s ability to draw you in was Gatsby-like, and was an ability that made him rich. But Thompson also admitted that Killy worked at his new profession, as much as he did in his previous one. Posted in Business, Olympics, Other Olympics, Others, Pop Culture, Winter Sports and tagged 1968 Grenoble Winter Olympics, Dynamic, Head, Hunter S Thompson, Jean-Claude Killy, The Great Gatsby, The Temptationos of Jean-Claude Killy. Bookmark the permalink.